I love my vintage crockpot. 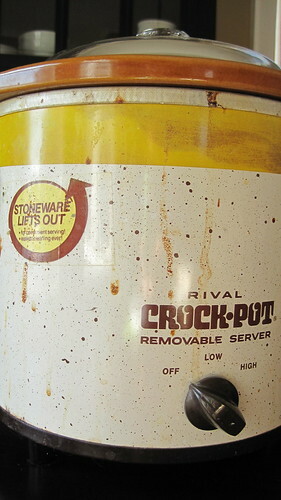 It was given to me by a friend years ago who was getting rid of some “junk” and, although I own two other crockpots that were actually made within the last decade, nothing compares to this groovy Rival. Everything that’s put into this crockpot comes out perfectly. Placing these ingredients into the crockpot before bed and waking up to a fully prepared breakfast with a beautiful and spicy aroma is a great way to infuse some warmth into a cold winter morning. The amount of water compared to the amount of oats seems way off, but sticking to the ratio below is critical to yielding a perfect consistency … these oats of steel soak it all up and expand considerably. I add fresh black pepper to the mix, because I like how it tastes with the spices, but its not necessary. 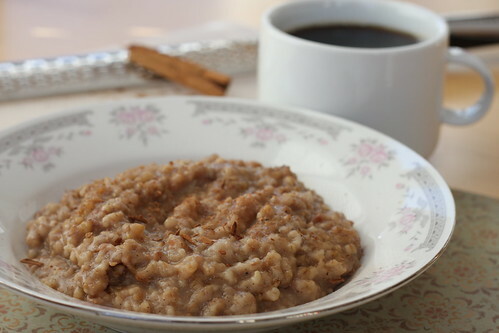 The leftover oatmeal also reheats nicely—just add a little water and pop into the microwave. Place all of the ingredients into the crockpot before bed, giving it a little stir. Cover and cook on low overnight, 7-9 hours. Remove the cinnamon stick before serving. This tastes good with a splash of soymilk and/or fresh berries. I've never made oatmeal in a crockpot before. What a nifty idea! This turned out yummy but a but a bunch stuck to the pot. Was ok to add sugar in the morning. Would it help to grease the sides? I usually have a little of oatmeal stick to the sides as well — just a little, but not a lot. The heat level on your pot may have been to high, or you may just need to shorten the cook time. Not sure if grease would cling to the sides enough to prevent sticking. When you call for 3 TB earth balance, do you mean their buttery spread or their soy milk?